Chutney is an East Indian condiment or sauce that’s made with fruit, vinegar, spices, and sugar. A sweet and spicy jam, if you will. This one is a bit thin, so more like a sauce than a thick jam. If you want a thicker chutney, you can cook it down some more. But, I like the thinness. It’ll go really well with pork or beef, as a sauce or a marinade. I want to try it with crackers over cream cheese. And, I want to dip some bread into it. Yum. It’s sweet and spicy and complex. It’s everything you want in a chutney (or a sauce). 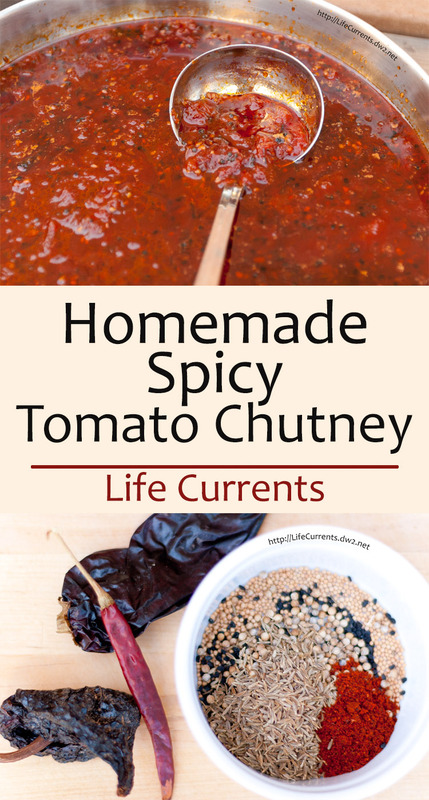 I discovered this recipe for tomato chutney when I was doing a little onion seeds research. I used fresh from the garden sweet summer tomatoes (thanks again Monica!). They have an incredible flavor and sweetness to them. In the post by Becks & Posh, she mentions that she also used very sweet tomatoes, and if you’re using tomatoes are aren’t so luscious, you may need to increase the sugar by up to twice as much as in the recipe. I’d be careful doing that, maybe just add by ¼ cup at a time, and taste after each addition. Or, just use sweet summer garden tomatoes. The chiles, from top to bottom, are the California Red Chile, the Chile de Arbol, and the Mulato Chile. In the bowl are all the spices to be used in the chutney. Place the oil in a large saucepan over medium heat. Add the seeds, the whole chiles and the chili powder to the oil. Cook one or two minutes until the seeds start to pop. Add the vinegar and sugar, and stir until the sugar is dissolved. Add the tomatoes to the spices, and bring the mixture to a boil. Turn the heat down to low, and simmer for an hour. After about an hour, the skins should be separating themselves from the tomatoes and floating to the top. While the chutney simmers, pick out the tomato skins using a pair of tongs. Continue cooking until the tomatoes have evenly broken down, about ½ to 1 hour longer. Using the tongs, pick out and discard the chiles. While the chutney is cooking, prepare (get out and make sure they are squeaky clean) the jars you’ll use to store and/or give away the preserves. Transfer cooked chutney to the clean ready jars. I don’t actually go through the canning process, but if you would like to do so, please follow the instructions from the USDA’s National Center for Home Food Preservation or the official site from the makers of Ball jars. Keep for up to two months. Refrigerate and consume within 2 weeks after opening. Makes approximately 8 jars. It’s easily halved. Juliana, Thanks so much. I typically think tomato based sauces can keep in the fridge, tightly covered, for up to about 4 days. Or you can freeze it for longer storage; I’ve always had really good luck freezing tomato sauces like this one. Like I say in the post, I’ve never canned it myself (I’m too lazy lol). If you would like to do so, please follow the instructions from the USDA’s National Center for Home Food Preservation or the official site from the makers of Ball jars.